Researchers from the University of Mississippi Medical Center were curious as to what fast food chicken nuggets were really made of. After all, they are incredibly popular in the U.S. In 2011, 50 billion pounds of broiler chickens were raised and sold, according to the National Chicken Council. And, about 50 percent of that meat was made into nuggets and similar products. However, the researchers found that for all this meat sold, much of the chicken nuggets we are served do not contain simply breast meat, as many fast food chains claim. An earlier study published in the Journal of Food Science and Technology found that up to 30 percent of processed meats are made up of fat. 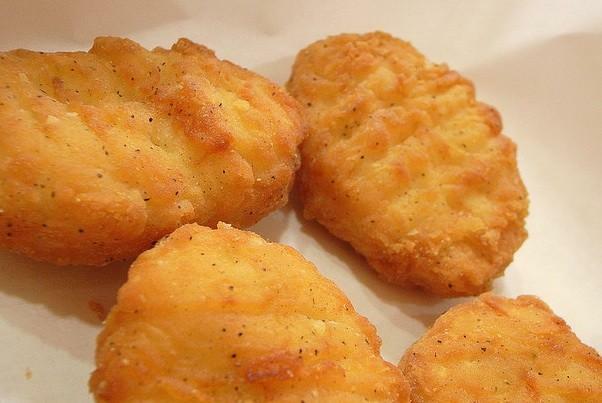 The new study claims that potentially even more than 30 percent of a chicken nugget may be made of fat. Large fast food chains and chicken processors, however, argue that chicken nuggets are made of 100 percent chicken meat and do not contain any disturbing ingredients. As if to make matters worse, the U.S. Department of Agriculture announced recently that it would no longer ban processed chicken imports from four Chinese poultry processors. Prevoiusly, chickens were raised then killed in the States, shipped to China to be processed, and then shipped back to the U.S. to be implemented into fast food and pet food products. "China does not have the best track record for food safety," The New York Times notes, "and its chicken products in particular have raised questions." Along with removing the ban, the USDA may be in the process of replacing USDA inspectors on U.S. chicken processing lines with poultry company employees themselves. Although this may seem questionable, the USDA believes these changes, if implemented properly, "would enable [USDA inspectors] to better fulfill our food safety mission."